Don’t Trust Your Feelings: Somatics and the Pre/Trans Fallacy – The Interchange Blog. It’s easy for counselors, and the people we counsel, to get stuck in our heads.Counseling as we know it originated as “the talking cure”. Over the generations, counselors have discovered how to use dialogue as a powerful medium for facilitating change in our clients. Even at its best, however, conversation can only get us so far. We are more than mere talking heads. In a tradition that has long been top-heavy, the growing prevalence of somatics has brought counseling back into balance,adding much-needed weight to the body’s role in healing and growth. “Soma” is the body, and body-oriented work takes us places talking never can, but just like mind-oriented work, it has significant limitations. For those of us in the world of counseling who strive to live fully embodied lives, somatics has seemed like such a godsend that we can fail to recognize its limits. 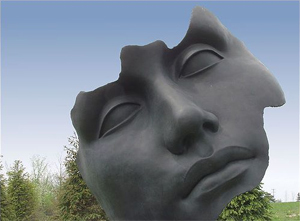 A practice that was once top-heavy can instead become headless, too much talking and thinking tipping over to become too much sensing and feeling. People get somatics happy and lose their balance. This swing of the pendulum too far in the other direction happens when somatics supporters fall prey to a particular fallacy, elevating somatics to a transcendent position above the mind, instead of down below it where the body belongs. To understand how this fallacy, the pre/trans fallacy, grabs onto those of us who are proponents of somatics, we first have to take a moment to get embodied. Human beings are physical creatures.Everything we’ve every experienced, we’ve experienced through our bodies. Despite our basic somatic nature, however, not all of us are equally embodied. Most of us were raised in disembodied communities that devalued inner knowledge, emotional development, and present-time awareness. For instance, how many people do you know that learned to breathe in kindergarten? Basic instruction in breathing can help people develop the ability to calm or energize themselves at will, to tolerate strong emotions, and to stay rooted in the present moment. Nonetheless, we fail to teach our children how to take conscious control of their breathing. That kind of instruction doesn’t fit in a mostly-disembodied school system. Physical education exists in our schools, emphasizing important physical capacities such as strength, endurance, and coordination, needed for competitive athletics, but it tends to leave out everything else: inner sensory awareness, subtle energetics, all the many relational aspects of embodiment, and the embodied aspects of relationship. Embodiment, as a result, is underdeveloped in many of us, and so somatics can fill in a wide range of missing developmental capacities. 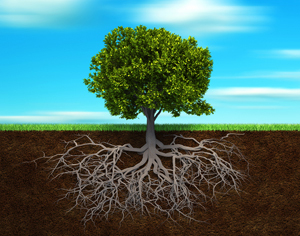 When counselors develop somatic awareness, and when we teach it to our clients, it provides at least three massive benefits to the counseling process. 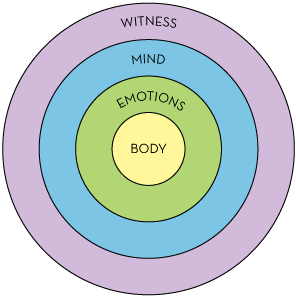 Trauma and emotional injury are not primarily cognitive experiences. Emotional hurts live in the muscles of the body, and in patterns of activation of the nervous and endocrine systems. Bypassing the content and meaning of emotional injury, instead directly addressing its somatic roots, can make healing more efficient and more thorough. The body provides numerous easy access points to the deeper levels of human experience. Attention to gesture, posture, facial expressions, voice intonations, and breathing allows us to attune to our clients’ inner experience. Directing our clients to strategically alter these non-verbal expressions, as well as working with movement, body symptoms, touch, and other kinds of physical contact, provides a repertoire of powerful interventions to explore and alter a person’s inner world. Teaching clients to track their “felt sense” experience, the constant stream of inner and outer sensations, opens them to learn essential somatic resources. For instance, we can teach people to self soothe, to become more grounded, or centered, or empowered, to sense and establish boundaries, to identify their needs and tell when those needs have been met, to follow or inhibit impulses, to sense their connection with others and deepen that connection, etc. All of these resources have strong somatic components. Somatics opens up a new developmental world, especially to people who missed these developmental pieces growing up. It is akin to training a person who has never developed their mind in the arts of perception, memory, logic, language, and lateral thinking. If you have been stuck in your life and stuck in your head, somatics can expand your world. If you have tried to work on yourself in counseling by thinking and talking, but failed to get where you wanted to go, somatics can be the vehicle that gets you there. If the head has been the problem, the body seems like the solution, but it isn’t. This is where the confusion begins. Rationality has its limits, especially when it comes to re-organizing a person’s inner experience, one of the basic goals of counseling. It seems that the way beyond these limits comes from embracing the non-rational, but it isn’t. Welcome to the pre/trans fallacy. The non-rational dimensions of human experience are divided into two categories, those which are below rationality on the ladder, and those which are above it. We commit the pre/trans fallacy (a concept introduced by psycho-spiritual philosopher Ken Wilber) when we collapse the pre-rational and the trans-rational into a single non-rational heap. Somatics is the realm of the pre-rational. Enamored with their newfound somatic abilities, many counselors, and the people they counsel, elevate somatics to the realm of the trans-rational, assuming that because it is non-rational, somatics must belong up on the pedestal of spirituality and higher development. This gets them into trouble. To understand the origins of the trouble, a Wilberian-type diagram will help. Think of a person as a series of concentric spheres. Each sphere includes everything within its nested spheres, and also transcends them.In the center is the body, where we begin: our physical, animal, biological nature, felt sense experience. The next level out is the emotions. Emotions include but transcend the body. Any time you’re feeling an emotion, you know what you’re feeling in part because of the sensations you have in your body, the physiological dimensions of the emotion. But emotions are more than just physical. The mind, the next level out, includes but transcends the body and emotions. We can focus our thoughts on body sensations and emotions; we can include the information we glean from our physical and emotional bodies in our thinking. But the mind is more than just physical and emotional. The witness is the next level out. If the mind is the mental organ, the witness is the spiritual organ. In fact, “spirit” could be included on this level, but I don’t want to lose my readers who are committed to a more mundane, secular perspective on the world, so I’m sticking with “witness”. You are able to witness your thoughts in the same way you can witness your sensations and emotions. Whatever is doing the witnessing therefore includes but transcends the mind. It is at this level that people are able to stop identifying with thoughts, feelings, and sensations, recognizing they are more than all of these put together. These nested levels of human experience can also be divided into the pre-rational, the rational, and the trans-rational. 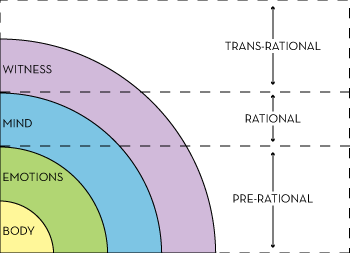 To understand the difference between pre-rational and trans-rational states, and why these states are sometimes confused, consider a couple of contrasts. One contrast is between merging and oneness. At the beginning of our lives, we have not yet developed a sense of separate self. We exist in a kind of primordial fusion with our mothers, both pre-rational and pre-personal. Everyone begins this way. Later on, well after we acquire a sense of self, there is a stage of spiritual development, which only some people reach, superficially similar to this early merged state. In this advanced stage, the illusory nature of the separation between what is perceived as self, and what is perceived as other, becomes more and more apparent, producing empathy, compassion, and an experience of oneness with everything: both trans-rational and trans-personal. These two states, merging and oneness, are profoundly different. If you are caught up in a fused state of codependence with your romantic partner, boundaryless, unable to be happy unless they are, which of these two states do you imagine yourself to be in? I would bet you’re hanging out in the pre-rational. They’re not the same. Another contrast is between intuition and integration. People love their intuitions, but an intuition is really just a sense of something that you have without understanding where it came from. This lack of understanding is an indicator that we are talking about a pre-rational state, and intuition, as often as not, is just a synonym for felt sense experience. As a San Francisco resident, this is a good place for me to mention that early on Ken Wilber referred to the pre/trans fallacy as “415 syndrome”, 415 being the area code of San Francisco. Here, perhaps more than anywhere, people revere intuition and other pre-rational forms of knowing as if they are states of spiritual attainment. Contrast this with someone who has integrated their somatic, emotional, and rational development and who has attained a level of understanding that transcends these levels. Such a person might be able to offer a rapid, synergistic insight that superficially looks like felt sense intuition. When pressed, however, they could back up and present the logical steps that led to their conclusion, demonstrating that higher faculties, not just the lower ones, contributed to the insight. These contrasts, between merging and oneness, and between intuition and integration, demonstrate common confusions between pre-rational and trans-rational states. Imagine what would happen if, instead of mere confusion, reverence for pre-rationality was codified into a system for living. Rediscovering the felt sense can be a revelation. All along, beneath the numbness or dissociation of disembodiment, the felt sense has been available as a constant stream of invaluable information. Uncovering this source of information makes all manner of things possible that weren’t before. For instance, someone who has struggled with indecision can now use the felt sense to help them evaluate their options. Some things feel wrong, others feel right; imagining taking one path leads to feelings matching those of poor decisions in the past, while imagining the other path leads to feelings like those that have accompanied times when life was better. As a person’s sensitivity deepens, these feelings provide ever more nuanced information about which path to take. This newfound sensitivity is so fascinating and exciting, that the person who develops it wants to use it for everything. Unfortunately, the felt sense is a terrible guide to making decisions. Sensations and emotions are constantly shifting and changing. Important decisions should never be based on sensations and emotions, but instead on something more stable. The felt sense provides a key source of information, one that should be integrated with other sources of information to result in a decision backed by sound thinking. However, if you’ve been over-analyzing decisions your whole life and getting nowhere, the felt sense feels like the way to come back to life, and it is. Following the felt sense will lead to greater aliveness, but integrating the felt sense with well-developed rationality will lead to more holistic and sustainable decisions. One strength of the somatics movement has been in the area of healthy, secure attachment. In cultural communities where the effects of violence and oppression are passed on from one generation to the next, which is pretty much all of them, our early relationships can be disrupted. This produces a population of people who struggle to form healthy, sustainable bonds. Relationships can feel unsafe, intimacy can produce anxiety, and people can oscillate between codependency and isolation. A somatic approach to relationship counseling often helps people establish the sense of secure connection they missed out on early in life. For instance, someone who is unable to bond with a romantic partner can develop that capacity, learning how to sense their connection to someone and to strengthen that sense of connection. Imagine the relief that can come from deeply sensing your connection to someone, and feeling safe with them, if you’ve never been able to sense that before. It can go far to solidify an unstable relationship. Unfortunately, the existence of a bond between two people should not be the determinant of whether they remain in a relationship. Bonding is a necessary but insufficient condition for relationship. Determining whether a relationship makes sense occurs somewhere in the nexus of attachment, differentiation, and a host a variables that determine relational compatibility and sustainability. A newfound ability to bond, however, is so powerful it can become a person’s primary guide to action, saving them from old forms of relational dissatisfaction, only to introduce them to new ones. Instead, the sense of connection, or lack thereof, needs to be reduced back down to a valuable source of information, but only one of many sources that need to be integrated to make relational decisions. Ultimately, the ability to create meaningful bonds of all kinds, most of them non-romantic, may be a trans-rational capacity. Such a capacity can never be developed without first filling in the missing developmental ability to attach to one person. Secure attachment is the root. Don’t confuse it with the whole tree. Somatics has been at the vanguard of trauma healing. Understanding of the physiology of shock and of overwhelm has led to somatic healing approaches. Clients can learn to slow down an otherwise overwhelming felt sense experience, to draw on learned somatic resources to make aversive feelings and memories more tolerable. Instead of getting overwhelmed or shutting down in response to traumatic memories, this slow approach, balancing challenging feelings with supportive resources, a bit at a time, allows people who have been badly hurt to release painful emotions and reorder their disorganized nervous systems. Even here, however, we need to remember that humans are not just bodies and emotions. The failure of analysis to produce healing has led many people to believe that it is only through the body that healing can happen. But remember, somatics just fills in missing, early developmental resources. While it is true that healing cannot happen without somatic resources, it is also true that healing cannot happen without including the dimension of meaning-making through which humans make sense of our worlds. Even if you help a person who has experienced abuse to metabolize their terror, to stop contracting or shutting down in the face of intimacy, and to breathe deeply and sense their own power instead, they are still left with an entire ecology of faulty beliefs amassed over the years in which the trauma was locked in the body. Disentangling the beliefs (about whether people are trustworthy, about how vigilant they need to be, about whether it was their fault that they got hurt, etc.) will always still be necessary. Neither understanding alone nor somatics alone is enough. These levels need to be integrated for true healing to take place. Filling in missing developmental capacities, and strengthening weak ones, is a primary activity of counseling. Acquiring a new developmental ability, like the tracking of felt sense experience, or the ability to securely attach to someone, can change a person’s world dramatically. Somatics excels at helping people complete missing pieces of early development. Let us, however, let soma be soma and nothing more. It’s so exciting to get our bodies back, and it should be, but taking up permanent residence at the lower levels of human development will not help us to integrate the pre-rational with the rational. Until such an integration occurs, the worthy goal of trans-rational development will be beyond our reach. “You have to be somebody before you can be nobody.” Buddhist psychotherapist Jack Engler gave us this memorable sound bite. Higher development, and cultural evolution, requires that we transcend the flawed model of separate self. Like all developmental processes, this one requires steps in a particular order. 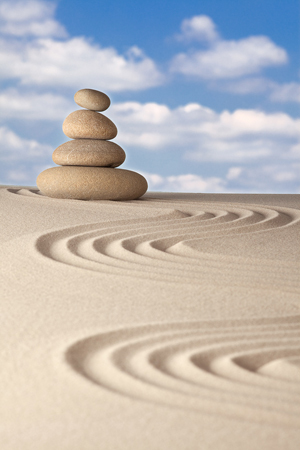 To move through the world as an integrated person, you must develop a strong, stable sense of self. If you never developed basic somatic and emotional capacities, you’ll need these. If you never developed the capacity to think, you’ll need that too. A healthy ego, and a strong sense of self, requires embodiment, emotional self-awareness, and clear thinking informed by the somatic and emotional levels of our experience. Integrating these three levels is a prerequisite to be able to go beyond them. With a strong sense of self as a stable foundation, a more complete model of being human can develop and a larger self can be born. Development never ends. Transcending rationality, and becoming our larger selves, is a developmental goal many people never reach. Somatics helps us prepare the ground. Don’t confuse it with the sky. This entry was posted on Friday, May 17th, 2013 at 1:07 pm	and posted in Body, Heart, Inspiration, Mind, Reblog, Relationships. You can follow any responses to this entry through the RSS 2.0 feed.